This is a spicy dish that perfectly suits this cool climate. This will be an easy to make treat for spicy sea food lovers. I have added roasted coconut in this recipe. You can use coconut without roasting. Even without adding coconut this dish is real tasty. So health watchers and people who do not like coconut, can avoid coconut. Heat oil in a shallow pan , add fennel seeds and fry for a minute. Add onions with curry leaves and fry till translucent. Add ginger and garlic; cook till the raw smell leaves. Now add the chopped tomatoes and cook in medium high flame so that the tomtoes will not ooze much water. Add the masala powders turmeric, chilli powder, pepper, garam masala and season with salt. Now add the prawns and salt. Mix well. Close with a lid and allow to cook for two minutes. Open the lid and cook, till the water gets evaporated totally. 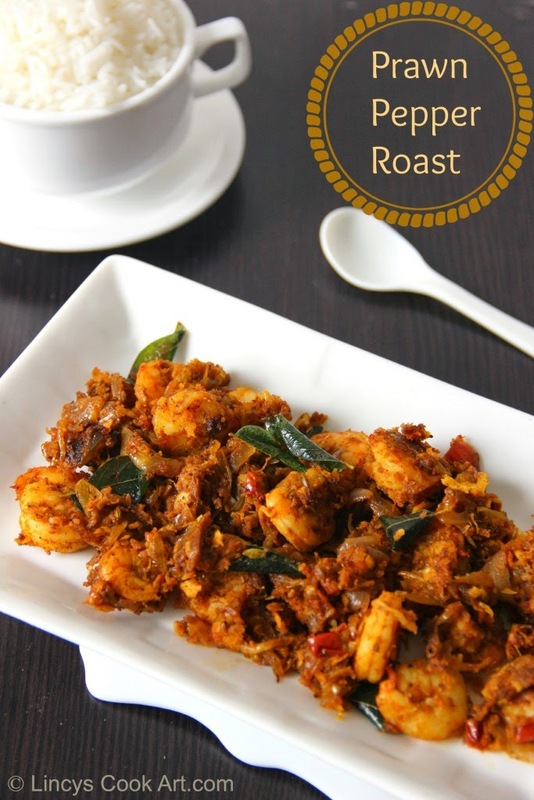 Roast some coconut lightly, add with the prawn masala; mix well and turn off the gas. Note: Prawns cooks fast, so dont over cook the prawns. if you over cook them it may turn rubbery. Looks yummy! Always love prawns! My all time favorite. your's looks very tempting.